His music just got to me, as it did for many people and it always gives me a great feeling inside to listen to it. Usually I’m up and dancing around. It’s that kind of music!! E-sir left this life, at 22, way too early for many of us, but than again, it might have been his time. His vision though, through his lyrics, will forever live as a reminder of a young musician who invigorated the Kenyan musical scene. His fame was short-lived, but his music legacy is enduring. As an artist, he was very focused, had long term ideas & goals, and worked tirelessly to get better every day. When he walked into the office of Francis and Lucas, collectively branded Ogepa DJ’s, they could sense a big talent and decided to work with him. And the rest is history as they say. 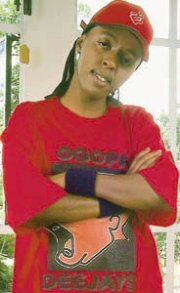 Francis, of Ogepa DJ’s, said in an interview by John Muchiri for BUZZ that... "E-sir was very different from other artists. He wanted to rule, he wanted to see fireworks and he was ready to work with us to achieve that status. He made a point of having a postmortem after every show. That’s when we knew that this was a serious artist. By the time he was coming to us, he had like a five-year work plan. At some point it was hard for us to understand how an artist could be thinking like that at his age. Most artists do trial and error before they start planning ahead." He will always be an inspiring story of a young man who expressed his thoughts through music, and his ability to relate his life experience with his gift of poetry, especially to young people. Ok, I’m off listening to some of my favorites, like Mos Mos, Leo ni Leo, Hamunitishi and Kamata!